Best AC Maintenance, Repair, Service and Installation Service in Dubai. Specialists in Air Conditioning Repair, Installation and Service. Professional AC Repair & Servicing, Fast, Efficient Fault Finding. Professional, Well Equipped and Hygienic Duct Cleaning Services. We are Dealers, Distributors & Suppliers of O General AC, Super General AC, Mitsubishi AC, Gree AC, LG Air Conditioners in Dubai and also provides Air conditioning services in Dubai from installation and maintenance to emergency air conditioning repairs. Air Conditioning Free Inspection, Fault Diagnosis and Maintenance Solutions. All Type of Air-Conditioning Services & Maintenance under AMC Contract. 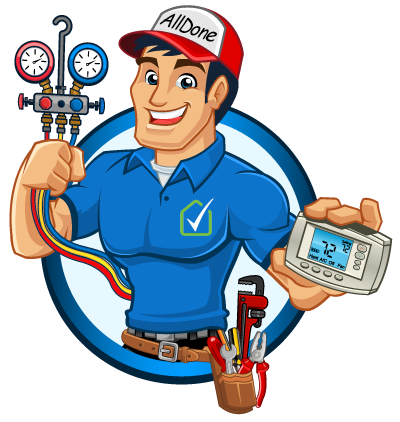 All Done Ac Maintenance Co. LLC is committed to achieving excellence and we are your go to company for all of your HVAC needs in Dubai. Are you tired of daily old Air condition repairing & maintenance or planning to Buy a new Air Conditioner unit? ALL DONE Ac Maintenance Dubai is a proud, licensed Ac installer, repairer, & Ac maintenance company in Dubai for Day & Night Air condition products. Day & Night systems are built for quiet operation, reliability, and durability. You get the benefit of the latest technology and a heritage of quality in systems that deliver maximum comfort to your home. If you’re overwhelmed by the options of different types of cooling systems, the professionals at ALL DONE can help you to narrow them down and install an Air Conditioner that works best for your needs, while maintaining maximum energy efficiency! Leave the tough stuff to us, we’ll take care of your Air Conditioning Installation from start to finish. Safe, Experienced, And Environmentally Friendly! Let ALL DONE help you with your Air Conditioning installation. ALL DONE AC MAINTENANCE COMPANY in Dubai Branch has proven that they have the knowledge and skills to diagnose the root cause of problems in your place and the ability to provide solutions to fix them right the first time. Air Conditioners can be complicated machines, that need to be installed correctly for them to reach their full potential. An incorrectly installed Air Conditioner can become a hazard to those around it, it can even cause damage to your place.! Our installers have the Air Conditioning installation training and certifications necessary to get the job done safely and correctly. Make sure it’s done right the first time with ALL DONE! Take 30 seconds and fill out our contact form, schedule your appointment online, or call ALL DONE at 050-2977603 for more information about any Air Conditioning needs in the Dubai area, and beyond! We are best Ac Maintenance Company in Dubai !!!!!! All Done is your trusted Ac maintenance company in Dubai which provides repairing service to a wide range of domestic, commercial and industrial major home appliances. Such as air conditioners, home appliances, electronics and electrical appliances of world famous brands. We specialize in air conditioning installation, repair and maintenance of residential/commercial/industrial and conditioning throughout Dubai. Call us 24/7 at 056 887 2900 for fast, reliable, same day service! At any given situation we are only a phone call away. Our highly trained technicians and well equipped workshop will take care of your product and ensure that it is put back into smooth working order with the least possible delay. All Done offers several exclusive guarantees that are unmatched in the HVAC industry. It’s important to us that you feel completely comfortable choosing us as your AC maintenance company. The best Air Conditioning (HVAC) Maintenance Dubai – from Split AC to central air conditioning systems for all types of residential, commercial and industrial air conditioning needs. We import, distribute, install, repair and maintain all types of air conditioners for all sectors and segments of the market. With innovative solutions and products, highly competitive pricing, energy efficient solutions, we bring to our customers the most effective air conditioning solutions. We provide professional air conditioning maintenance, repair, supply and installation for all types of A/C units including Central A/C, Duct Split Type A/C, Wall Mounted Split A/C, Package Unit A/C, Chiller A/C and many more. Our quality air conditioning repair services are performed by professionally qualified, HVAC service technicians. Means we have the experience, skills, tools & latest technology to fix HVAC problems right the first time. All of our ac repairs services are guaranteed 100% in writing for your complete peace of mind. Best air conditioning repair, supply, installation and air conditioning maintenance for all brands of air conditioning units, throughout Dubai. Ac Maintenance Dubai by All Done Ac Maintenance Co. L.L.C your first choice in air conditioning installation, services. We are a family-run business specializing in the sales, supply, installation and repair of all the leading brands in air conditioners, evaporative cooling, split systems, gas ducted heating and ducted refrigerated heating and cooling. Although our company has grown over the past 30 years, our promise has always remained the same: to provide the best deals on heating and cooling in Dubai. We won’t be beaten on price. As the largest air conditioning installation company in Dubai, we regularly partner with leading Air Conditioning brands such as O General, Super General, Mitsubishi, Daikin, Samsung, Supra and LG to run All Done Ac Maintenance Co. LLC specials. Our size means that we are able to stock Air Conditioning systems for the best prices, and pass those savings on to our residential and commercial customers. Meadows, Springs, Lakes, The Gardens, Discovery Gardens, Dubai Marina and Al Sufouh, Jumeirah Beach Residence (JBR), Horalanz, Hamriya, Nad-al-Hamar, Mardif, Al Wasl, Al Quoz, Al Warqa, Deira, Rigga Road, Bur Dubai, Emirates Hills, Downtown Dubai, Palm Jumeirah, International City, International City 2, Silicon Oasis, Business Bay, Sheikh Zayed Road and surroundings, Jumairah Village Triangle (JVT), Jumairah Village Circle (JVC), Remraam, Marina, Mira 1, Springs, Sustainable City, Al Furjan, Studio City, The Lakes, Motor City, Arabian Ranches, Green Community, Arabian Ranches, DIFC, Jumairah Lake Towers (JLT), Jaddaf, Jebel Ali, TECOM, Oud Metha, Mirdif, Jumeirah, Jaflia, World Trade Center, Karama, Oud Metha, Wafi City, Mankhool, Raffa. O General, Super General, Lg, Supra, Aftron, Rheem, Samsung, Daikin, Mitsubishi, Gree, Haier, Panasonic, Ruud, Adams, Addison, Aire-Flo, Amana, American Standard, AquaCal, Arcoaire, Axeman-Anderson, Ariston, Armstrong, Biasi, Bryant, Buderus, Burnham, Carrier, Central Boiler, Centurion, Clare, Coleman, Columbia, Comfortmaker, Daikin, Dayton, DeLonghi, DMO Industries, Dornback, Ducane, Dunkirk, Emerson, Evcon, Fedders, Friedrich, Frigidaire, Fulton, General Electric, Gibson, Glowcore, Goldstar, Goodman, Haier, Hallmark, Hamilton Engineering, Heil, Homart, Intertherm, Janitrol, Keeprite, Kenmore, Kerr, Laars, Lennox, Luxaire, Maytag, Mitsubishi, Munchkin, Newmac, Olsen / Airco, Oneida Royal, Parker, Payne, Peerless, Pennco, Polaris, Rheem, Ruud, Samsung, Sanyo, Sears, Sharp, Slant/Fin, Spartan, Tappan, Tempstar, Thermal Solutions, Thermo Pride, Trane, Trianco, Utica, Viessmann, Weatherking, Weil-McLain, Westinghouse, Whirlpool, Williamson-Thermaflo, York. ac maintenance dubai, hvac repair, central air repair near me, hvac maintenance,hvac maintenance companies in uae, hvac maintenance companies in dubai, hvac maintenance service, hvac installation dubai, hvac services, hvac services near me, hvac installation, hvac maintenance dubai, hvac repair dubai, , air conditioning in dubai, maintenance ac, air conditioning companies in dubai, air duct cleaning dubai, air conditioner, ac duct, central air conditioner, ac repair companies in dubai, hvac contractors, central air conditioning system, air condition, dubai air conditioning, hvac system, hvac unit, dubai air conditioning company, ac cleaner, ac mechanic, air conditioning unit, ac contractors in dubai, ac in dubai, o general split ac 2 ton, york ac dubai, o general air conditioners, o general air conditioner, ogeneral ac, o general split ac 2.5 ton, o general price, o general 2 ton split ac, o general ac models and prices, ac maintenance, ac repair, ac service, ac services, ac installation, air condition maintenance dubai, air conditioning and heating, ac maintenance services, ac service dubai, home maintenance services in dubai, industrial air conditioner repairing servicing, ac repair dubai, air condition maintenance, commercial air conditioning, a/c maintenance, ac repair services dubai, chiller maintenance companies in dubai, maintenance dubai, chiller maintenance, ac companies in dubai, ac service and repair in dubai, maintenance company dubai, air conditioning companies in uae, ac installation dubai, home maintenance services dubai, dubai maintenance, ac cleaning dubai, dubai ac cleaning company, duct cleaning dubai, hvac companies in uae, air conditionoing, air conditioning maintenance companies in uae, best ac maintenance dubai, emergency ac repair dubai, air conditioning repair, air conditioning cleaning dubai, hvac. We cover everything when it comes to Air conditioning maintenance and repair, simply call us now on 050 297 7603 or fill the form available on this page to get an instant solution for your ac problem in Dubai. We made Ac Maintenance now in your flexible budget.